Pattison Onestop today has launched Art in Transit, a new curated arts programme on the Pattison Onestop Digital Mall Network, which will screen every five minutes in 42 shopping centres across Canada. Ad from March 25 – April 7, Pattison Onestop digital mall screens will feature the Best of TUFF, showcasing unique, silent one-minute creations from the Toronto Urban Film Festival, North America’s largest commuter film festival. 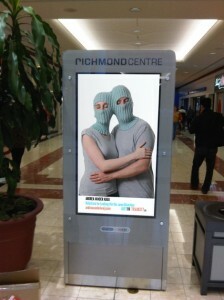 This entry was posted on Tuesday, January 15th, 2013 at 10:00 @458 and is filed under DailyDOOH Update. You can follow any responses to this entry through the RSS 2.0 feed. You can leave a response, or trackback from your own site.